The style you want, the accessibilty you need. The A.R.E. Fusion provides you with a paint-to match finish in a tri-fold cover. Fold the panels open for quick and easy full bed access or keep them closed for added security and styling. 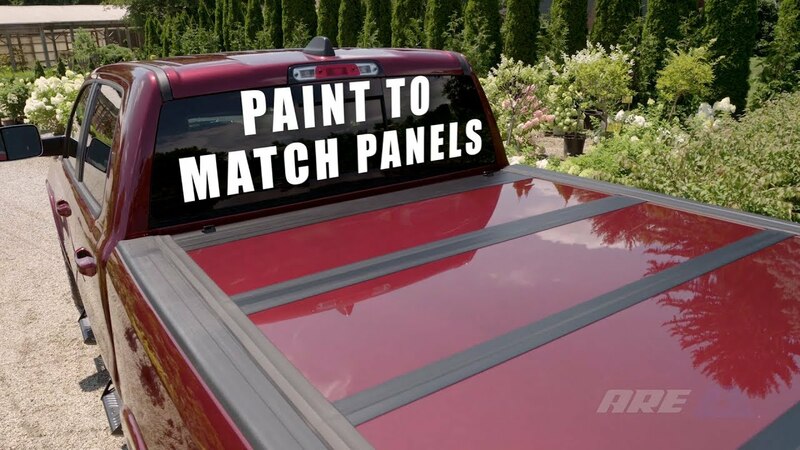 Painted to Match The aluminum panels are painted to match your truck color code for added style. Weather Resistant Exterior and interior seals help deflect elements from entering your bed. The Fusion also features a drain track that helps push any water to the front and out of bed. Full Bed Access The Fusion has a tri-fold design that allows the cover to be folded up all the way up to the cab for full bed access. Universal Tailgate Operation The sleek, low profile design achieves a seamless edge appearance where the Fusion meets your truck's tailgate. Your truck's tailgate can be open or closed with the Fusion in it's closed position. Easy Install The clamp on design allows for an easy install in 30 minutes or less. The A.R.E. Fusion folding truck bed cover can be installed on your pickup quickly. It has an easy clamp on installation. Each product comes with easy to understand installation instructions. A.R.E. warrants the structure of your Fusion cover to be structurally free from defects in material and workmanship for (5) five years from the retail date of purchase. The hinges, seals, and hardware are warranted to be free from defects in material and workmanship for (5) five years from the retail date of purchase. This warranty applies only to the original purchaser and is nontransferable. Your original sales receipt will serve as proof of purchase for this warranty. Before credit can be issued on a warranty claim, proof of defect may be required. This can be determined at the time of the claim. The following statement for the paint only - A.R.E. warrants, for life of the product, that the exterior paint will not abnormally fade or peel, due to material or workmanship defect, faster than the original pickup it was installed on. Covers not painted at the factory are excluded from this warranty. A.R.E. does not guarantee a 100% paint match, due to variables from one trucks paint to another, some variance is to be expected. Not covered under this warranty is failure due to neglect, improper installation including any modifications to installation hardware, alterations, addition of equipment, abuse, accident, weather related damage, exposure to chemicals that are not labelled "safe for rubber" and normal wear from lack of maintenance. Always read the ingredients of any product you are using to clean your Fusion Cover. Make sure that you use only products that are safe for use with rubber. Many chemicals contain material that will permanently discolor or damage your Fusion Cover hinges and seals. This is not considered a manufacturer defect. Incidental or consequential damage or loss of contents due to use, neglect, lack of maintenance, misuse or abuse of the Fusion Cover is the sole responsibility of the truck owner and operator. Paint damage to your truck is not covered under this warranty. When operating your truck always keep the Fusion Cover in either the fully closed and latched position, or one of the two approved open positions. The first approved open position would be the first, second, and third panel stacked onto the forth panel and the buckles must be secured together. The second approved open position would be all four panels standing up vertically behind the cab. In this position both prop rods must be attached and the buckles secured. Do not operate the truck at excessive speeds with the Fusion Cover in either open position. A.R.E. recommends periodically checking the front retainer clamp/star knob assembly to ensure a proper fit. In the event that your Fusion Cover is found to be defective under the terms of this warranty, it is at the discretion of A.R.E. to repair or replace the defective part. All repairs must be made under the direction of A.R.E. A.R.E. is not responsible for any transportation costs associated with the warranted claim.